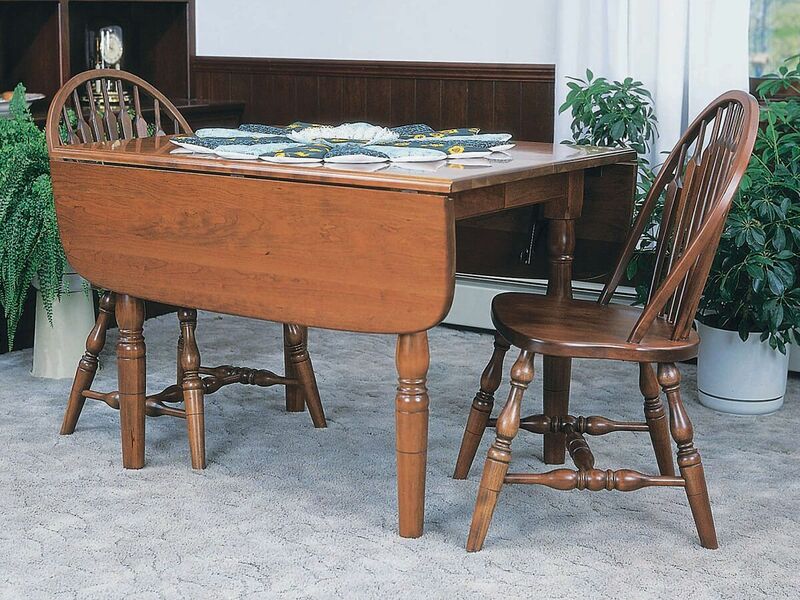 With two means of expansion, our Elnora Drop Leaf Table is an Amish handcrafted masterpiece capable of seating twelve comfortably in your dining space. This practical Elnora Drop Leaf Table can be used as a traditional dining table, or it can be tucked out of the way until you need it. The 12" leaves easily flip up for a little extra table space, while additional leaves can be purchased for center expansion. Turned legs and a roundover table edge will adorn your hardwood Elnora Drop Leaf Table. Choose from a variety of woods and stains to customize your solid wood Elnora Drop Leaf Table. If you prefer the pictured look, consider Cherry as your wood type hand-stained in Salted Caramel. Or, request wood finish samples to view at home before making your final decision. *Up to seven 12" center leaves available. Base size does not include any of these leaves. **Center leaves will not self-store.